In some previous blogs, I’ve touched on the importance of Public-Private Partnerships (PPPs), and I’ve certainly written about the importance of investing in infrastructure. Decades of underfunding have resulted in huge costs to the economy and a rapidly faltering infrastructure system. PPPs radically help with these issues by harnessing capital and utilizing private sector project management know-how to more efficiently create and update infrastructure. High quality and reliable infrastructure is essential to our economy and to our daily lives. We need to continually modernize and maintain our roads, bridges, and water systems to ensure that the United States remains an attractive place for companies to do business and for Americans to live, work, and travel. That’s why President Obama has called on Congress to increase federal investments in our nation’s infrastructure, especially our transportation system. Earlier this year, the President sent Congress the GROW AMERICA Act, a six-year, $478 billion proposal to increase funding for highways, roads, bridges, transit, and rail systems around the country. While there’s no replacement for public investment, private capital can play an important role to supplement public spending. That’s why in July 2014, President Obama also launched the Build America Investment Initiative (BAII) to increase public-private collaboration in infrastructure investment and spur economic growth. 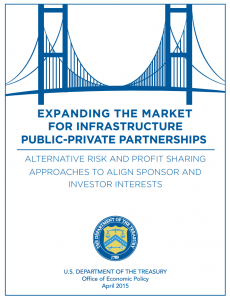 Today, as part of that initiative, the Treasury Department is releasing a white paper that explains new ways to share risks and profits between state and local governments and potential investors in public-private partnerships, or PPPs. By suggesting new frameworks for PPP design, the paper aims to help attract more private investment in infrastructure, and in turn, spur economic growth and create opportunity for hardworking Americans. Years of underinvestment in our public infrastructure have imposed massive costs on our economy. We can more easily meet our nation’s infrastructure needs by expanding sources of investment and using those dollars as effectively as possible to advance the public’s interest. Other advanced economies, including Australia, Canada, and the United Kingdom, rely heavily on PPPs to secure private financing for infrastructure. Based on our research and engagement with stakeholders, significant private capital could be mobilized for infrastructure investment, even though few PPP projects are currently being executed in the United States. Executed well, PPPs harness private sector capital and management expertise to address the challenges of modernizing and more efficiently operating infrastructure assets. Under a PPP, a government contracts with a private firm to design, finance, construct, operate, and maintain an infrastructure asset on behalf of the public sector ― or to take on some but not all of those roles. Taxpayers can benefit through lower long-term project costs, improved service quality, and faster completion of infrastructure projects. By contracting with private partners that support strong labor standards, PPPs can also provide local economic opportunity and create good, middle-class jobs that benefit current and aspiring workers. 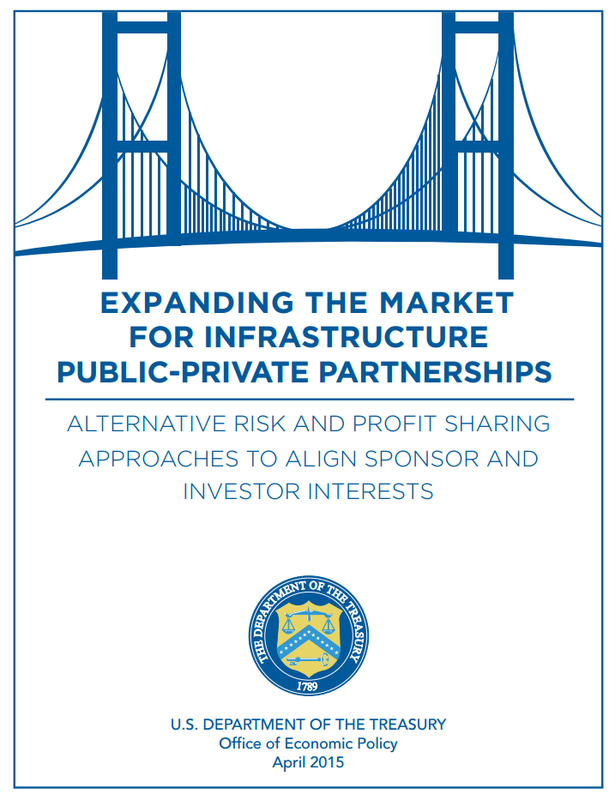 Our white paper, “Expanding the Market for Infrastructure Public-Private Partnerships: Alternative Risk and Profit Sharing Approaches to Align Sponsor and Investor Interests,” explains how PPPs can allow for profit-sharing. For example, the private partner may transfer a portion of its earnings directly to the government, creating opportunities for more infrastructure investment, or the private partner’s cost savings may lower the price of using the infrastructure, thus sharing those savings with consumers. Profit-sharing on a toll bridge operated as a PPP could translate into lower tolls for drivers. Or, in a PPP-operated water system, it could mean more investment to replace aging pipes. By expanding the options for sponsors and investors to consider in PPP negotiations, the risk- and profit-sharing approaches discussed in the paper have the potential to increase the number of PPP deals and improve the odds of the projects’ long-term success. These projects will build on the progress our economy has made by helping small businesses to expand, manufacturers to export, investors to bring jobs to our shores, and lowering prices for goods and services for American families.